Governor, 1851-54, U.S. Senator, Congressman, member of peace conference, 1861, and of state conventions, 1861, 1875. 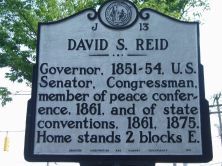 Home stands 2 blocks E.
David Settle Reid, in addition to being governor, served in both houses of Congress; his long political career extended beyond the era of Reconstruction. 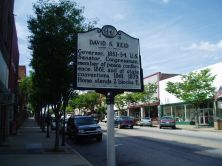 The oldest son of Reuben and Elizabeth Settle Reid, David Reid was born on April 19, 1813, in Rockingham County and was raised in a community that in time became the city of Reidsville. Forced to earn his keep at a young age, in 1829 he was appointed postmaster at the age of sixteen. On December 19, 1850, Reid married Henrietta Settle, daughter of Thomas Settle Sr., and they were parents of four children. Through hard work, Reid rose quickly in wealth and popularity. In 1835 he achieved two goals, being elected colonel of the county militia and a state senator at the age of twenty-two, in time becoming a leader of the Democratic Party. Reid played an influential role in passage of the 1839 public school law. The state’s first public school opened in Rockingham County in 1840. Aided by realignment, he won his second bid for election to the U. S. House in 1843. There he supported the expansionist policies of President James K. Polk including statehood for Texas, resolution of the Oregon dispute, war with Mexico, and subsequent Mexican territorial cession. As the Democratic choice for governor in 1848, Reid agreed to run only if permitted to introduce the issue of elimination of the property requirement to vote for state senators. Narrowly defeated by Charles Manly, Reid ran again in 1850 on the same issue, defeating Manly and sending the Whig party into eclipse. Other planks in Reid's campaign called for “judicious” internal improvements, more support for public schools, and defense of southern rights. The last was paramount in his inaugural address on January 1, 1851. While professing loyalty to the Union, Reid declared that the suppression of states’ rights would violate the Constitution and negate such allegiance. Reid’s two terms as governor were marked by expanded internal improvements, appointment of Calvin H. Wiley as the first Superintendent of the Common Schools; initiation of the geological survey; and confirmation of land titles held by Cherokee Indians who had remained in North Carolina. Reid also proposed replacing the land and poll tax with one based on the value of one’s estate, but it was not seriously considered by the legislature. 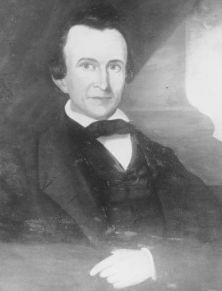 On November 24, 1854, the General Assembly elected David S. Reid to fill a vacancy in the U. S. Senate, and he turned over gubernatorial duties to Warren Winslow. During his term in the Senate he spoke in defense of states’ rights, reflected in support for the Kansas-Nebraska Act. Defeated for re-election in 1858, Reid retired to private life, stepping back into the public arena occasionally to defend southern rights. His last political venture came in the Convention of 1875 where, from behind center stage, he directed Democratic Party activity and influenced constitutional reform. Reid suffered a severe stroke in May of 1881 that left him paralyzed. He fought failing health for a decade before succumbing on June 18, 1891. He was buried in Reidsville.